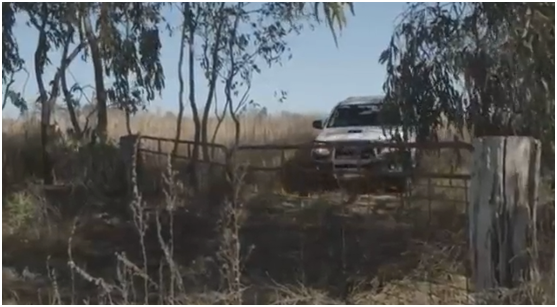 Energy giant Santos’ quest to win the hearts and minds of NSW farming communities about coal seam gas has backfired after one of its TV ads has been exposed as a con, writes environment editor Sandi Keane. NOTE: Santos appears to have now pulled the conjob ad as a resut of Sandi’s exposé! See UPDATES at the end of this piece. Warwick Moppett posed for Santos pro-CSG ads in front of crops he didn’t farm, on land neither he nor Santos had any permission to enter. DON HUBBARD is a fourth generation farmer, and grows canola, sorghum, durum wheat, cotton and sunflowers. He has two properties at Spring Ridge, Cooininee and Tavetare, at the foot of Mt Coolanbilla. He’s lived on the property since he was 5 years old and knows it like the back of his hand. 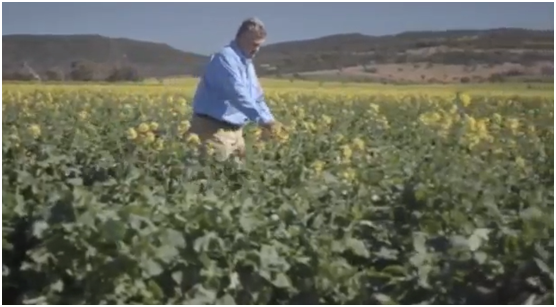 So, when he sat down to relax during spring this year after a day’s canola harvesting, he was shocked to see his property – and that of his neighbours, Ben and Phoebe Clift – featured in a Santos coal seam gas (CSG) ad on the TV. Don Hubbard’s property is 45 km from Gunnedah on the Liverpool Plains ― one of the most productive agricultural zones in Australia. 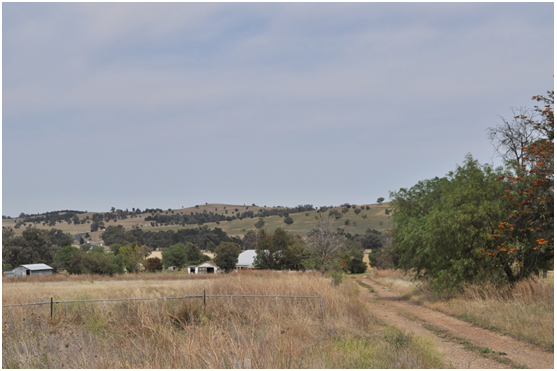 He identified Mt Coolanbilla in these two scenes (pictured at the piece and below) and the canola crop as the Clift’s. 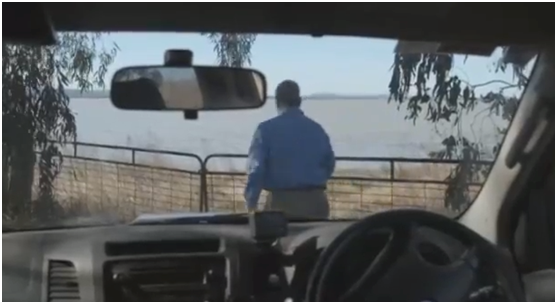 The scene following Warwick Moppett, a Santos employee, walking through the Clift’s canola crop is a one of an old gate leading to a lake. The gate leads into another of Hubbard’s properties, Tavetare, and the lake is Lake Goran, which adjoins his farm. Warwick Moppett pulling up to the entrance to Don Hubbard’s property. The next shot shows Warwick Moppett walking up to the gate to Tavetare and opening it with Lake Goran beyond. The old gate leading to Tavetare, owned by Don Hubbard, on the shores of Lake Goran. The truth is, Don Hubbard knew neither the man posing as the owner of his property nor the film crew — yet all of them had blatantly trespassed upon his property and those of his neighbours. 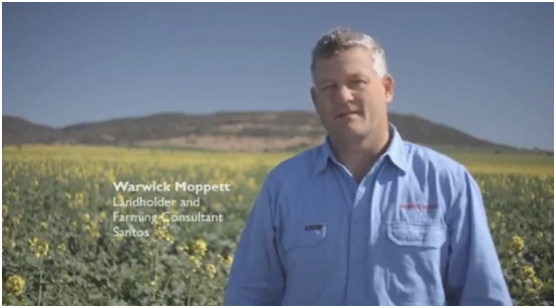 According to the ad, Warwick Moppett, is a “landholder and farming consultant”. He is there to give a message is one of hope for nervous CSG investors. “We found water, he says, showing Lake Goran beyond Hubbard’s gate, and adds: “we fixed access tracks”, “improved fences” and “of course, some money in my pocket” — the vision shows Moppett teasing and caressing some cotton bales. Moppett enjoys the Kelly’s cotton bale. The cotton bales Moppett rather proprietarily examines during the ad belong to another Gunnedah farming family ― Trish and Ben Kelly. 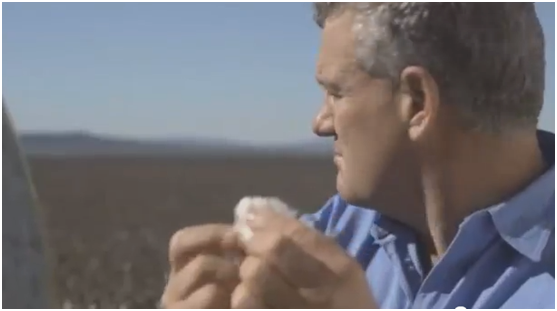 Like Don Hubbard, they had no idea their cotton crop was filmed for the ad. Warwick Moppett with the cotton sample standing in front of the Kelly’s cotton field. Ben and Trish have no delusions about the damage done to farms by CSG mining. They’ve visited Chinchilla in Queensland and describe the land as “cesspits” and the “ponds”(as CSG miners call them) as “500 acre toxic dams”. “Cesspit” created by CSG in Queensland (Collinsvale). Like Hubbard, the Kelly’s successful dryland farm operation also produces canola, wheat, barley, sorghum, sunflowers and chickpeas. Ben Kelly describes himself as a “custodian” of the land, which he’ll be passing on to his children. “When the gas runs out though, what then? The food bowl will have been destroyed,” says Kelly. 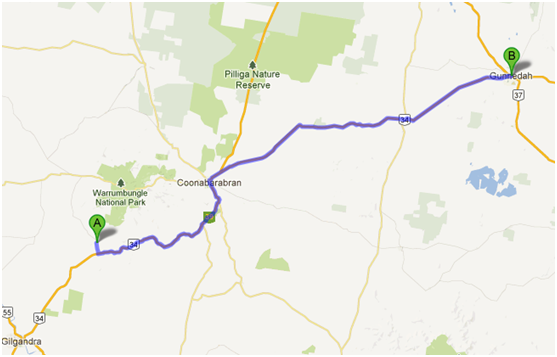 “A”= Tooraweenah, “B” = Gunnedah, 45km from Spring Ridge. Lake Goran is shown in blue south of Gunnedah. I decided to check out Warwick Moppett’s farm. His farm, Everleigh, is not in the Gunnedah Basin, nor on the Liverpool Plains, but at Tooraweenah, near Gilgandra ― two hours’ drive away from where the ad was shot. 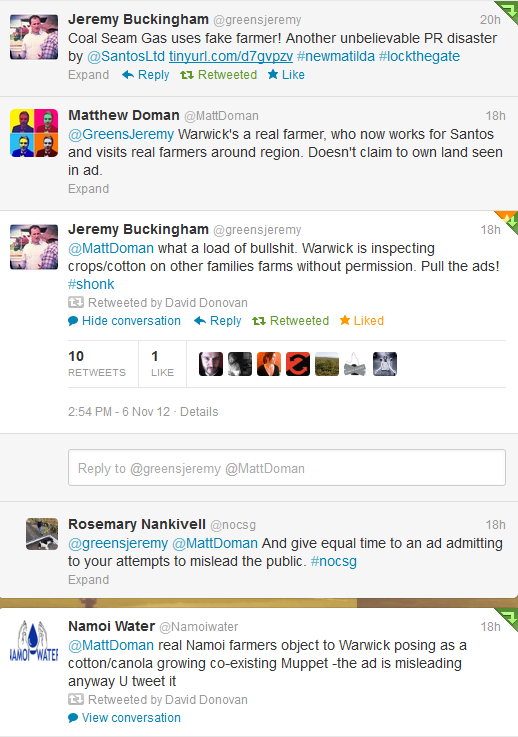 So, why did Santos not film their ad on Warwick Moppett’s property? 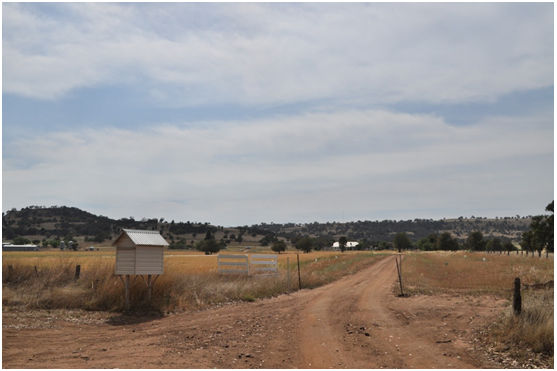 Entrance to Moppett’s property Everleigh, O’Connors Road, Tooraweenah, NSW. “To the best of my knowledge, there’s never been any other crop except for fodder, not even wheat. It is very hilly with very little flat country and definitely not cotton or, for that matter, canola country. Another view of Moppett’s property Everleigh. The Liverpool Plainsregion currently produces much of Australia’s wheat, corn, sunflower, canola, cotton and other grains, as well as cattle and sheep farming. So its farming community were understandably shocked when the O’Farrell government opened the floodgates to coal seam gas mining in September, by renewing twenty-two CSG exploration licences, including many of the most controversial titles in New South Wales. Liberal MP Scot MacDonald — to be referred to ICAC for allegedly accepting gifts from gas company Santos, after praising coal seam gas drilling in NSW. 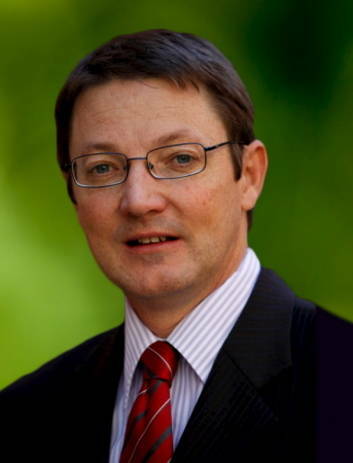 Greens’ mining spokesperson, Jeremy Buckingham, has referred the gift to the Independent Commission Against Corruption. As a result, the conservative Western Australian Government has quarantined its iconic Margaret River food production region from mining. The Coalition governments in the eastern states, however, look set to continue to gamble their future on mining royalties. 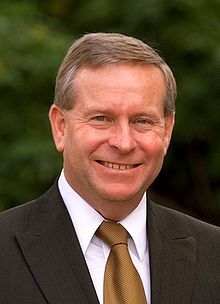 WA Premier Colin Barnett: not so eager to sell out farmers to fossil fuel interests. The Federal Labor government has, meanwhile, recognized the important role of food and fibre for the Asian region. Its white paper, Australia in the Asian Century, predicts a surge in food exports as an increasingly affluent Asia is expected to push demand 70 per cent higher by 2050 from 2007 levels. • Manage the potential impact of coal seam gas and large coal mining developments on water resources, including supporting an independent expert scientific committee*. • Develop a national framework with state and territory governments on coal seam gas that will address key community concerns on water management, multiple land use, best practice and co-existence. 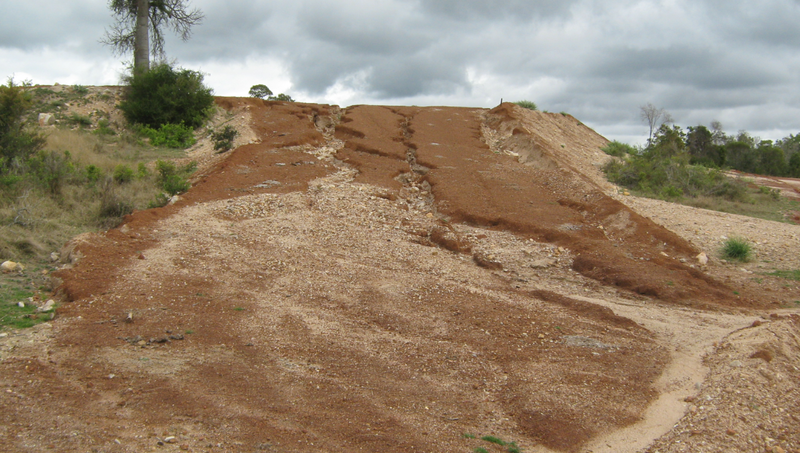 The NSW Greens’ spokesperson on mining, Jeremy Buckingham MLC, claims the National Food Plan fails to adequately address the major threats to agriculture of mining and gas development. On the weekend, at the Australian Greens National Conference, the Country Greens were formed and held their first meeting. The Greens say they plan to give country communities a real choice at all future state, territory and federal elections. In fact, Don Hubbard says: “There is no way an operating broadacre farm can co-exist with CSG wells”. It is true the Kelly’s bales were on the side of the road as there is no fence there but as Trish Kelly says, they are their bales. 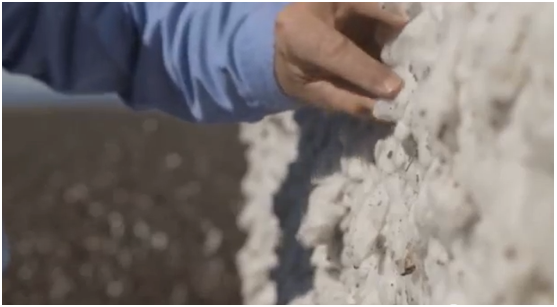 Thus, when Warwick Moppett takes a sample of cotton out of one of them, he is technically touching private property, quite apart from the fact that he clearly gives the impression they are his bales with the synchronized voice-over: “money in my pocket”. Last weekend, the Kelly’s, owners of the cotton bales, received an apologetic phone call from Mark Rogers of Santos. * TheEnvironment Protection and Biodiversity Conservation Amendment (Independent Expert Scientific Committee on Coal Seam Gas and Large Coal Mining Development) Act 2012waspassed on 10 October 2012. SANTOS PULLS AD … OR DO THEY? After the publication of this piece in New Matilda yesterday, Santos’ Group Manager of CSG policy and communications, Matt Doman, vainly tried last to defend the advertisement on Twitter and other platforms. It didn’t work; he was crucified. Santos have retreated from this position now. Today, Dugald Saunders from Dubbo radio station ABC 2CR interviewed Warwick Moppett along with Sam Crafter, Santos’ manager of community and government relations, where Crafter was reported to have said that, given community concern, Santos would be pulling the advertisement discussed in this piece. LATEST UPDATE: Santas DOES pull ad!